Due to the frequency and severity of the storms and flooding that struck communities across the United States this spring - conditions that continue to devastate and challenge many areas and their residents - Church World Service has responded with material aid on a scale that has depleted warehoused and pre-positioned supplies. In particular, the supply of emergency clean-up buckets has run precariously low. 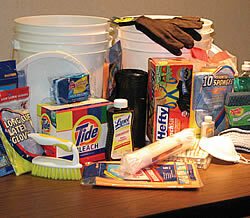 "The clean-up bucket is a valuable and time-tested item in disaster recovery work. These buckets contain the supplies and instructions folks need as they begin the work of returning their homes to a new place of normal. They are a tangible sign of support and concern and a practical gift of materials and supplies," said Bert Marshall, New England Director for Church World Service. Find information about the buckets here. CWS has issued an urgent appeal for buckets. Buckets that are not shipped immediately will serve to replenish the supply and re-establish a higher level of disaster preparedness as we respond to the spring storms across the U.S., including the tornadoes that impacted western Massachusetts, and prepare for the onset of hurricane season. The Masschusetts Conference has set a goal of 1,111 buckets. The deadline for collection is Friday, Aug. 5. Buckets may be dropped off at the Conference office, 1 Badger Road, Framingham. Call or email ahead: 508-875-5233 x 271; montgomeryd@macucc.org. Buckets may also be delivered to Christ Congregational United Church of Christ, 1350 Pleasant Street, Brockton. Call ahead: 508-586-3022.